We came to meet Ashleigh and John because unfortunately, another photog dropped the ball. Selfishly, I'm so happy they did. 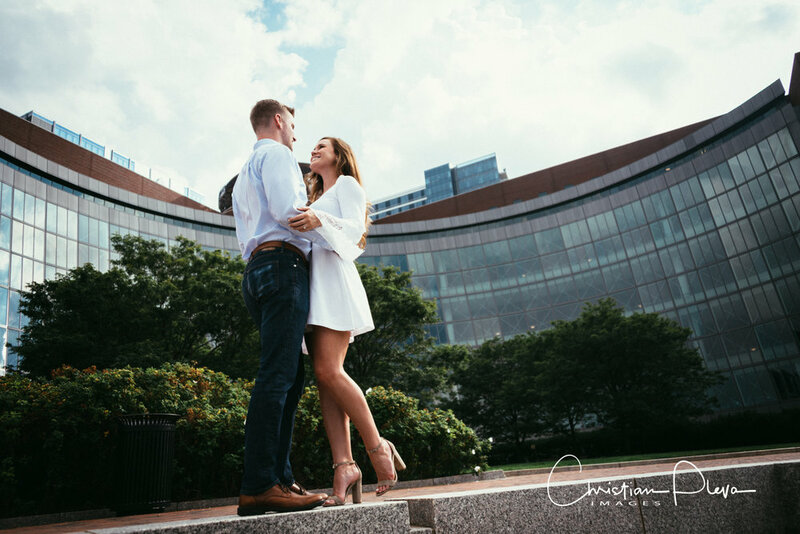 Engagement photography is at it's best when you get to put a beautiful couple up against the Boston skyline, you can't help to have fun and make great images! It also doesn't hurt at all when they are a blast to work with. I think when we were finished I could have just sat all night laughing at a pub with them. John and Ashleigh met in Boston, MA in April 2013 through a mutual friend, Alyson, who Ashleigh knew from college at James Madison University and John knew growing up in Sudbury, MA. Ashleigh was pursuing her Master's degree at Boston University at the time, and after a long week of exams was more than looking forward to the weekend. Alyson invited her to a party at her friend's apartment and Ashleigh gladly accepted the chance to get out of school mode. Ashleigh ordered a cab and was on her way to meet Alyson when she received a call that Alyson was, in fact, running 45 minutes late. By this time, Ashleigh was already dropped off on the side of the road in front of the apartment where the party was located in Beacon Hill...in the freezing cold and not knowing a single person upstairs. She stood outside, pacing to keep herself warm, half considering leaving altogether, when out of nowhere the front door of the building opened and she heard, "Ashleigh?". It was none other than Ashleigh's future fiance, John Hayes! Alyson had called John and tasked the poor guy with taking in the girl that no one knew and entertaining her until her friend arrived. Lucky for Ashleigh, he was more than happy to do so. They immediately clicked. They found themselves chatting and laughing the majority of the night with just each other. They found common ground in both attending college in Virginia, Boston sports, and their love for dogs. As the evening came to a close, Ashleigh hopped in a cab with Alyson to head home. Without Ashleigh knowing, Alyson took it upon herself to text John Ashleigh's number and suggested he take her out for pizza and beer (the way to my heart). We went out on our first date the following week and the rest is history! Ashleigh graduated as a Physician Assistant from MCPHS University in Boston on May 6th, 2017 and all her family from Virginia came to town to celebrate. Ashleigh was absolutely over the moon to have the ones she loved most around for the weekend, but little did she know how her graduation day would play out. Graduation took place at Gillette Stadium on the most rainy, dreary, cold day in months - of course! Ashleigh was so grateful that everyone, including John's wonderful parents, endured the terrible weather to watch her cross the stage that morning. Following the ceremony, everyone decided to grab a late lunch at Brewer's Fork, a restaurant around the corner from Ashleigh and John's condo in Charlestown, MA to dry off and grab a bite. The day had carried on with more rain, but as lunch wrapped up the sun finally started to peak through the clouds. John suggested that we head to our condo to freshen up, relax, then meet up with the rest of the group again for dinner in a few hours. Once they got back to the condo, John suggested they head up to the roof deck to enjoy some of the nice weather and he would bring up Ashleigh's graduation present. Ashleigh thought to herself, "Oooh maybe a new purse? New jacket? Watch?" as she stood with her back to the roof deck stairs, facing the Boston skyline with her hands covering her eyes in excitement. John whispered to "turn around" and Ashleigh found him on one knee with a gorgeous ring in hand. According to John, Ashleigh did not say "yes" for several minutes, sobbing and hugging him instead. She finally said yes, through more tears of happiness, and she spent the next hour staring at the ring in disbelief. To cap it off, neighbors across the street on their roof deck saw John proposing and recorded the entire thing! They spent the rest of the night sipping champagne, opening gifts, and celebrating with our wonderful family and friends! Awesome. Christian was professional but also relate-able. He could tell we were "nervous" and stiff at first, and gave us tips along the way. He was conversational and friendly, and even let us stop for a quick beer during our session to get the nerves out.